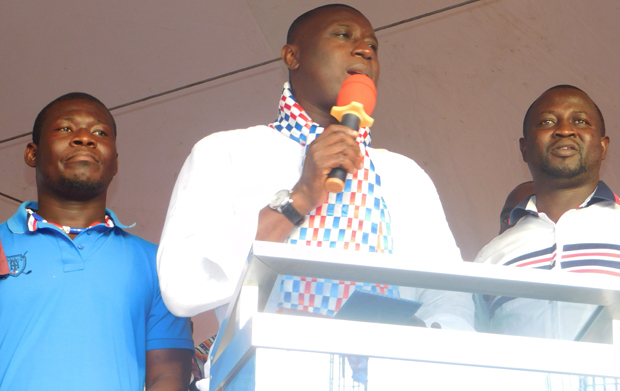 The youth wing of the New Patriotic Party (NPP) in the Anyaa-Sowutuom constituency of the Greater Accra Region at the weekend launched its campaign to mobilise more youth in the constituency for a landslide victory in the 2020 general elections. At the launch, various groupings who have been courted into the fold of the youth wing in the constituency including young ladies in trade, deaf and dumb youth and ‘okada’ riders were introduced. The occasion was also used to launch an appeal for support to help raise more financial resources to be able to effectively carry out its ‘room-to-room’ and ‘door-to-door’ campaign to win over 70 per cent of the votes in the constituency. Speaking at the function, the Member of Parliament (MP) for Okaikwei Central, Patrick Boamah, said the youth definitely play a key role in the advancement of the party and are like the ‘roots’ for the growth of the party. According to the MP, the youth also hold the future of the party so the leadership of the party would definitely resource the youth wing adequately to win more souls for the party and strengthen the roots of the party. For his part, the national youth organizer of the party, Henry Nana Boakye, asked the youth of the party to exercise restraint since the government is gradually putting the economy on the right footing to be able to create more opportunities for the unemployed youth in the country. He asserted that this is the time the youth of the party must solidly stand by the party and work hard for the party to retain power for more opportunities to be created for them. “We the youth will never allow former President Mahama to come back to destroy what we have achieved for Ghanaians in this short time including NABCO , IDIF, Planting for Food and Jobs and other social interventions,” he stressed. The Greater Accra youth organizer of the party, Moses Abor, said the youth could be right in asking for opportunities to improve their conditions of living after working hard to get the party into power. He appealed to ministers and government officials to always open their doors to the youth of the party who knock on their doors to seek for support since that would always encourage them to ‘die’ for the party. The constituency youth organizer, Samuel Awuku Larbi, whose initiative engendered the launch of the campaign, said the youth in the constituency would work very hard to chalk up victory for the current MP and the President, Nana Akufo-Addo. Other speakers at the event were the Mayor of Accra, Mohammed Adjei Sowah, and the regional women’s organizer, Grace Acheampong.